a systemic illness characterized by extensive ecchymoses and hemorrhages from mucous membranes and very low platelet counts; resulting from platelet destruction by macrophages due to an antiplatelet factor; childhood cases are usually brief and rarely present with intracranial hemorrhages, but adult cases are often recurrent and have a higher incidence of grave bleeding, especially intracranial. a bleeding disorder characterized by a marked decrease in the number of platelets, resulting in multiple bruises, petechiae, and hemorrhage into the tissues. Causes include infection and drug sensitivity and toxicity. A diagnosis is reached only by the exclusion of other causes. Considered to be a manifestation of an autoimmune response, two distinct entities, acute and chronic thrombocytopenia, can be differentiated on clinical manifestations alone. The acute form usually occurs in children between 2 and 6 years of age and is benign, with complete recovery usually apparent within 6 weeks. The chronic form usually occurs in adults between 20 and 50 years of age. Recovery is rarely spontaneous and often requires adrenocortical steroids or splenectomy. Compare disseminated intravascular coagulation. See also hemophilia, hemorrhagic diathesis, idiopathic thrombopenic purpura, thrombasthenia. observations Common manifestations include petechiae and ecchymoses on the skin, particularly the lower extremities; easy bruising; bleeding from the nose and gums; melena in stools; hematemesis; heavy menses and breakthrough bleeding; and hematuria. Jaundice, fever, and decreased levels of consciousness may be seen in thrombotic thrombocytopenic purpura. Diagnosis focuses on obtaining a history of bleeding symptoms and on ruling out other causes of thrombocytopenia, such as medications, ethanol abuse, HIV, or hematologic disorder. Lab findings include decreased platelet count. Bleeding time is prolonged, but coagulation time is normal. Capillary fragility is increased. Bone marrow aspiration shows an abundance of megakaryocytes. 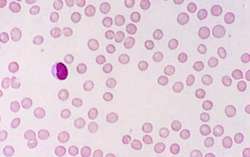 In thrombotic thrombocytopenic purpura there is severe anemia, elevated BUN, elevated creatinine, elevated reticulocytes, elevated LDH, decreased haptoglobin, and fragmented RBCs on peripheral smear. Platelet size and morphologic appearance may be abnormal in thrombotic thrombocytopenic purpura. Complications include hemorrhage into organs, such as the brain, gastrointestinal tract, or heart, which can be fatal without treatment. interventions Medications that may be causing or contributing to the thrombocytopenia are discontinued. Treatment is determined by platelet count and bleeding status. Corticosteroids are used to enhance platelet production and promote capillary integrity. Immunosuppressants are used if the disease does not respond to steroids. Platelet transfusions are used in cases of severe bleeding in idiopathic thrombocytopenic purpura. Plasma exchange or plasmapheresis is the treatment of choice in thrombotic thrombocytopenic purpura. VinCRIStine may be used in thrombotic thrombocytopenic purpura cases that are refractory to plasmapheresis. Splenectomy may be considered for severe unresponsive thrombocytopenia. Immune globulin is given to prepare severely thrombocytic individuals for surgery. Platelet counts and bleeding episodes are monitored closely. Stool softeners are administered to prevent constipation. nursing considerations Nursing goals are aimed at eliminating gross or occult bleeding, maintaining vascular integrity, decreasing risk for injury, and reducing complications. Safety precautions are instituted to prevent bruising (e.g., mouth swabs and soft bristle toothbrush for oral care; electric razor for shaving; insertion of IV access device for blood draws; padding bed rails and hard surfaces). Emesis, sputum, stool, urine, and other secretions for occult blood and pad counts during menstruation are frequently assessed and tested. Active bleeding is controlled with ice packs, gentle pressure, or packing. Rest and activity should be carefully balanced to conserve energy. Education is necessary about trauma prevention and safety precautions; avoidance of contact sports; avoidance of Valsalva's maneuver; the necessity for gentle coughing, sneezing, and nose blowing; and the necessity for increased fluid intake and balanced periods of rest and exercise. Instruction is given in infection precautions for those taking immunosuppressants. Education includes instruction to avoid anticoagulant over-the-counter medications, such as aspirin/aspirin products and other NSAIDs. A systemic illness characterized by extensive ecchymoses and hemorrhages from mucous membranes and very low platelet counts; resulting from destruction in the spleen of platelets to which an autoimmune globulin is bound; childhood cases, which often follow viral infection, are mild and transitory; in adults, bleeding may be recurrent and severe. Synonym(s): immune thrombocytopenic purpura, purpura hemorrhagica, thrombopenic purpura. Visible haemorrhages into the skin, mucous membranes and elsewhere resulting from a decreased number of PLATELETS (thrombocytes) per unit volume of blood. Platelets are necessary for normal clotting of the blood. A systemic illness characterized by extensive ecchymoses and hemorrhages from mucous membranes and low platelet counts; resulting from platelet destruction by macrophages due to an antiplatelet factor. a hemorrhagic disease characterized by extravasation of blood into the tissues, under the skin and through the mucous membranes, and producing spontaneous ecchymoses and petechiae on the skin. Similar lesions are produced in many specific diseases, e.g. epizootic hemorrhagic disease of deer, bracken poisoning in cattle, and leptospirosis in calves. In immune-mediated purpura there is a defect in the integrity of the vessel wall due to immunological mechanisms, which may also cause a thrombocytopenia. immune-mediated purpura; see also purpura. purpura associated with increased fibrinolytic activity of the blood. a well-defined disease of horses, occurring sporadically, usually associated with a respiratory tract infection. Clinical signs include cold, subcutaneous, edematous swellings, usually about the head and not always symmetrical, mucosal petechiation and high heart rate; affected horses commonly die within a few days. Nonthrombocytopenic. alloimmune hemolytic anemia of the newborn in pigs is sometimes accompanied by a thrombocytopenic purpura, caused by antiplatelet antibodies. See also alloimmune thrombocytopenia. purpura without any decrease in the platelet count of the blood. In such cases the cause of purpura is either abnormal capillary fragility or a clotting factor deficiency. purpura associated with a decrease in the number of platelets in the blood. See also immune-mediated thrombocytopenia. that caused by loss of vascular integrity or function, as seen in vitamin C deficiency (scurvy), diabetes mellitus and hyperadrenocorticism. Clinically significant newly presenting autoimmune thrombocytopenic purpura in adults: a prospective study of a population-based cohort of 245 patients. Children and adults with thrombotic thrombocytopenic purpura associated with severe, acquired Adamts13 deficiency: comparison of incidence, demographic and clinical features. ADAMTS13 activity and the presence of acquired inhibitors in human immunodeficiency virus-related thrombotic thrombocytopenic purpura. Recurrent ischemic stroke in a patient with idiopathic thrombocytopenic purpura. Performance of a clinical prediction score for thrombotic thrombocytopenic purpura in an independent cohort. Chronic immune thrombocytopenic purpura in children: assessment of rituximab treatment. 4% (5/17) and refractory Idiopathic Thrombocytopenic Purpura having 11% (2/17) of the cases. Kremer Hovinga JA, Studt JD, Lammle B: The von Willebrand factor - cleaving protease (ADAMTS13) and the diagnosis of thrombotic thrombocytopenic purpura (TTP). Laparoscopic splenectomy for chronic idiopathic thrombocytopenic purpura. Peripheral digit ischemic syndrome can be a manifestation of postoperative thrombotic thrombocytopenic purpura.